Steel Track Groups : SARL Maxima, Specialists in the sale and reparation of machines and accessories for the construction industry. Importer and distributor of both hydraulic and pneumatic equipment. 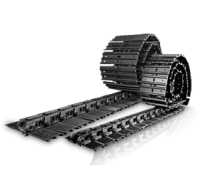 We stock a comprehensive range of steel tracks & track groups for mini diggers and excavators. high durability and long life. A full advice service and guidance on conversion from rubber to steel and steel to rubber is given. Please contact our team for the right track group for your machine.